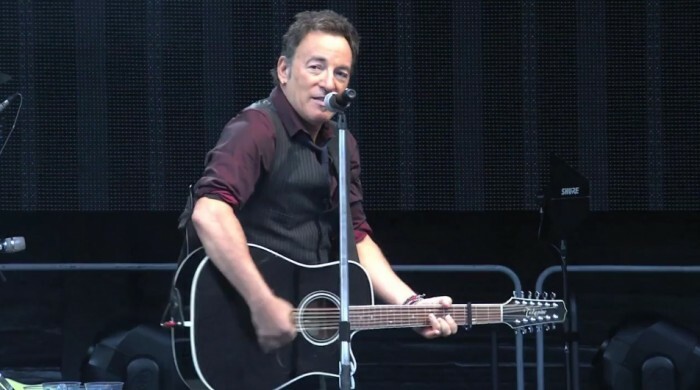 "Berlin, largely a working class city, has been a special place for Springsteen since his July 1988 concert behind the old Iron Curtain in East Berlin. Watched by 160,000 people, or about 1 percent of then Communist East Germany's population, it was the biggest rock show in East German history, and The Boss boldly spoke out against the 'barriers' keeping East Germans in their portion of the city. Some historians have said the concert fed into a movement gaining moment at the time that contributed to the tearing down of the Berlin Wall 16 months later in November 1989. 'Once in a while you play a place, a show that ends up staying inside of you, living with you for the rest of your life,' he told the crowd on Wednesday after being handed a poster from a fan thanking him for the 1988 concert. 'East Berlin in 1988 was certainly one of them.'" Hence, the emotional reasons for last night's special premiere performance of the song "When I Leave Berlin" by British folk musician Wizz Jones from his 1973 album of the same name. Except for that unforgettable 1988 show, which was the band's largest concert ever, this has been Bruce and E Street's best and most inspiring tour of Germany. Bruce ended last night by thanking the great audiences in Frankfurt, Cologne, and Berlin and telling them, "We love you, and we'll be seeing you."